Amazing coincidence - a bird with a transmitter! Here's a remarkable story about a bird that survived Superstorm Sandy. A Northern Gannet was flying over the Atlantic Ocean near New Jersey’s south shore, just as Sandy reached the coast there. Coincidentally, the gannet wore a tiny GPS transmitter on a tail-feather, so scientists were able to track its movements. As the gannet neared the northern edge of the storm, it made an abrupt about-face and winged briskly north and then east, beyond the reach of the winds. Here the bird waited out the massive storm. And afterward, the gannet flew back to where its detour had begun! Send this show to a friend. Click on one of the Share This Story icons. Thanks! Superstorm Sandy wreaked havoc on coastal New Jersey and New York. The stories of how people endured Sandy’s wrath are a testament to the human spirit. Here’s another remarkable story to emerge from the storm. A Northern Gannet, a sleek pelican-sized seabird, was flying over the Atlantic Ocean near New Jersey’s south shore just as Sandy reached the coast there. It happened that the gannet wore a tiny GPS transmitter on a tail feather, so scientists were able to track its movements. As the gannet neared the northern edge of the storm, it made an abrupt about-face and winged briskly north toward Long Island. Then it flew east along the continental shelf to a region beyond the reach of Sandy’s howling winds. Here the bird waited out the passage of the massive storm. Then, picking up where it had been interrupted earlier, the gannet flew all the way back to the same patch of ocean off south Jersey where its detour had begun. Birds that live on the ocean are adapted to coping with powerful storms. Still, some inevitably perish in such forbidding conditions. 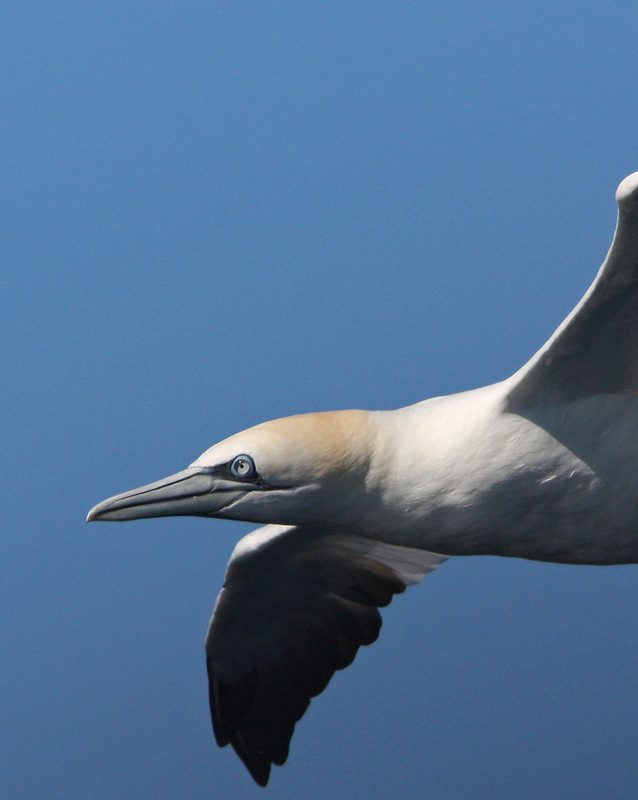 The scientific tracking of a gannet’s journey yields new insight and tells a remarkable story of a seabird facing and surviving Superstorm Sandy’s fury. Send this show, or any other, to a friend, from our website, birdnote.org. Bird sounds provided by The Macaulay Library of Natural Sounds at the Cornell Lab of Ornithology, Ithaca, New York. Calls of Northern Gannets  recorded by M. Fisher.